Lotus Foods: Support us with edible credits. 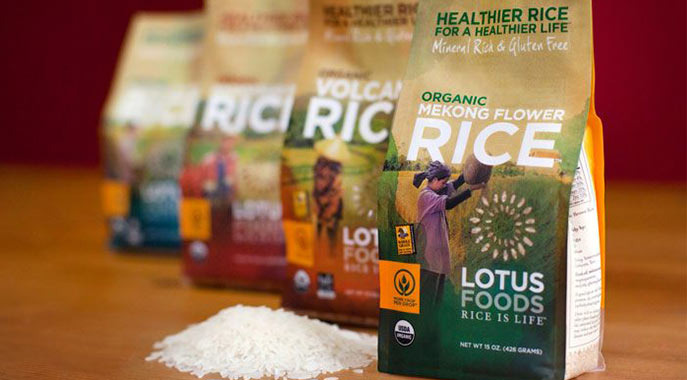 Established in 1995, Lotus Foods is a leader in the specialty rice category, having pioneered the introduction of heirloom rice to the US market. Our mission is to partner in fair trade with small family farmers in countries such as Bhutan, Cambodia, China, Madagascar and Indonesia, who are growing rice sustainably and preserving rice biodiversity. The company’s intent and vision is not only to help rice farmers earn a living wage but to bring healthier rice choices to consumers. Lotus Foods offers organic rice products, with each rice varietal distinguished by its terroir and valued for its distinctive cooking quality, taste, texture, aroma, color, and nutritional value. In 2008, Lotus Foods expanded its social and environmental commitment by establishing new supply chains with marginalized rice farmers using novel practices to achieve higher yields with fewer resources, especially water. We distinguish these in the market as More Crop Per Drop™. Lotus Foods is a certified B Corporation. We would use the money to create more market incentives for farmers who are growing rice more sustainably while providing consumers with more nutritious rice choices! At the register, use the Credibles app on your smartphone to redeem your credits for Lotus Foods.